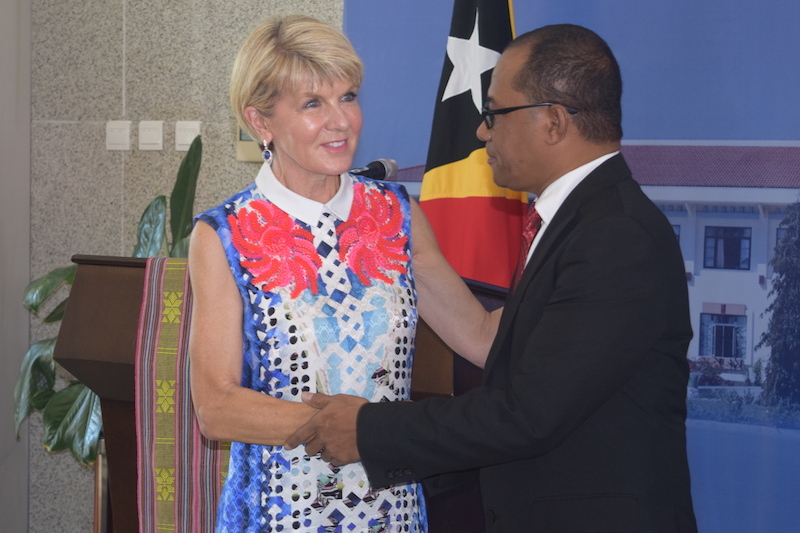 Australian Foreign Minister Julie Bishop arrived in Timor-Leste at the weekend, on her first official visit and the first by any Australian minister to the country in five years. Bishop arrived with the promise of a beatific “new chapter” in the two nations’ previously fraught relationship. Bishop’s assertion that the Greater Sunrise development is now a matter for Timor-Leste and joint venture partners washes Australia’s hands of the gridlock. The time between trips is explained by the protracted battle between the neighbours to draw a permanent maritime boundary in the oil-rich Timor Sea. With the March signing of a boundary treaty, Bishop could pull out her diary and book in the three-day trip, the beginning of a 10-day tour of Southeast Asia intended to reaffirm Australia’s commitment to its region and deepen relationships with new governments. 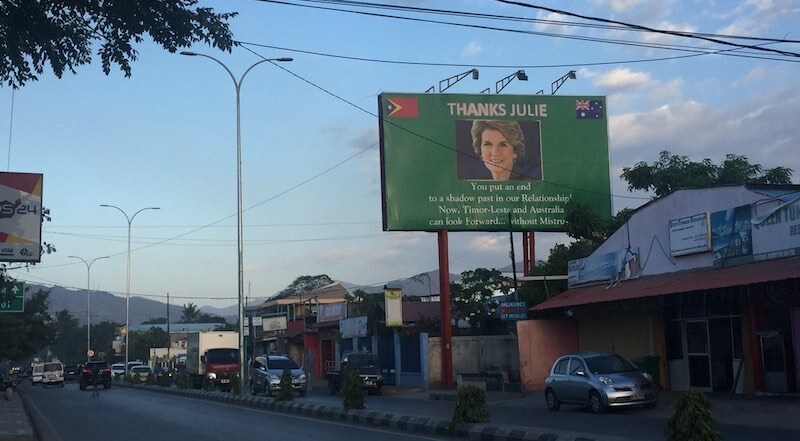 At the announcement of the treaty signing in March, green billboards appeared in Dili sporting Bishop’s portrait and the sincere message, “Thanks, Julie”. But if Bishop is hoping for that same easy appreciation now, a few months on, she’ll be disappointed. Against the backdrop of an already splintering new local government that is spending unsustainably, a stalemate on Greater Sunrise development and public fury over the prosecution of “Witness K” confronts Bishop in Timor-Leste. It exposes the tension that remains between the nations despite the minister’s most optimistic words. Bishop’s Timor-Leste visit comes only days after protests in Dili, Sydney, Melbourne, and Darwin saw hundreds gather in support of the whistle-blowers charged with revealing Australia’s bugging of Timor-Leste during lucrative oil and gas negotiations between the two countries in 2004. The anonymous former Australian Secret Intelligence Service (ASIS) agent “Witness K” supervised an Australian espionage effort that saw microphones secretly installed in government buildings in Dili under the guise of an Australian aid–funded refurbishment program. Witness K and his lawyer, Bernard Collaery, concluded that Australia was spying in order to skew Timor Sea negotiations and gain an unjust share of the US$65 billion Greater Sunrise gas field that lies in the north-eastern corner of the disputed area between the countries. The surprise decision this month to charge the pair with conspiracy to share information about ASIS was met with fury in Australia. The independent MP Andrew Wilkie, who used parliamentary privilege to reveal details of the prosecution, in parliament called it an “insane” development made all the more curious by the timing of the treaty. “It seems that with the diplomacy out of the way, it’s time to bury the bodies,” Wilkie said. Bishop hasn’t left this anger behind in Australia. Timorese activists have condemned the decision, likening the prosecution to charges laid against Timorese by former Indonesian dictator Suharto during the 24-year-long Indonesian occupation of Timor-Leste. In a brief press conference with Timor-Leste’s Foreign Affairs Minister Dionísio Babo Soares in Dili on Monday, Bishop refused to be drawn on the Witness K issue, calling it a “domestic legal matter” for Australia and refusing to confirm whether she’d bring it up in subsequent meetings with Timor-Leste president Francisco “Lu Olo” Guterres and Prime Minister Taur Matan Ruak. Bishop similarly stepped back Australia’s role in the development of the Greater Sunrise gas field, a key issue of the boundary dispute, saying it remains a question for the Government of Timor-Leste and development joint venture partners. “Our interest is a pathway to maximise prosperity for the people of Timor-Leste,” Bishop said. It is a well-intentioned sentiment, and there’s no doubt Timor-Leste’s prosperity and security are priorities for Australia. But to predict a “new chapter” in the countries’ relationship without acknowledging the Australian government’s pursuit of the pair who exposed unjust dealings bogs down efforts for Timor-Leste’s development. So too does the stalemate over Greater Sunrise development. Timor-Leste draws around 90% of its public budget from its Petroleum Wealth Fund, financed by Timor Sea oil and gas fields predicted to run dry as soon as 2022. Bishop’s assertion that the Greater Sunrise development is now a matter for Timor-Leste and joint venture partners washes Australia’s hands of the gridlock. Timor-Leste is adamant that LNG processing takes place onshore in the country, while oil companies refuse to contemplate what is seen as the commercially unviable option. Initially delayed by Guterres’s rejection of 11 ministerial candidates due to allegations of corruption, governing coalition Change for Progress Alliance (AMP) has now successfully passed through parliament its program and a new law authorising an extraordinary US$140 million transfer from the country’s Petroleum Wealth Fund to finance state activities for July and August. Timor-Leste’s previous minority government was unable to pass a state budget. The AMP government has thus been operating on a shoestring since January, which is reportedly affecting the country’s nascent private sector and razing its ministries’ budgets. Last week the coalition encountered further trouble with the surprise resignation of former president and prime minister Xanana Gusmão from his previously approved role as an adviser to his former adversary Taur Matan Ruak. In June, Gusmão refused to attend the government’s swearing-in after ministerial nominees from his party were rejected, and his decision to step down entirely is the surest sign of fissures within the three-party coalition, which banded together to win an unusual parliamentary majority in the 12 May election. Gusmão was Timor-Leste’s chief negotiator for the maritime boundary treaty and will retain control of Timor Sea development discussions. He is not scheduled to meet Bishop on her Timor-Leste visit. 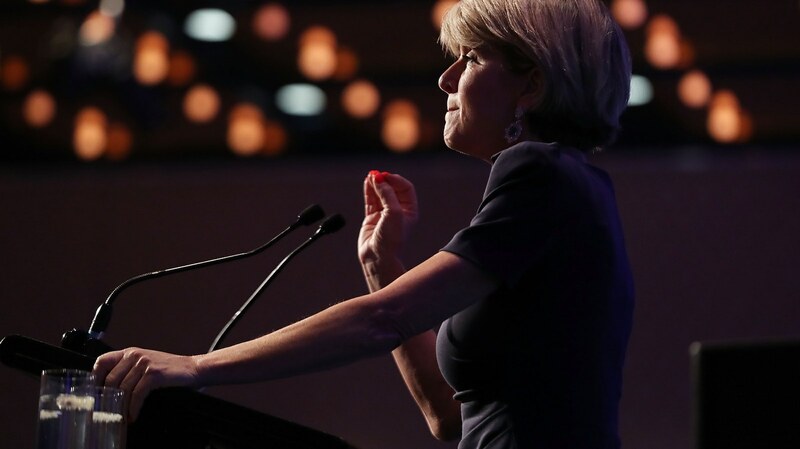 For Bishop, it is unclear how the promised “new chapter” will be realised without recognition of Australia’s past wrongdoing and release of the handbrake that remains on Timor-Leste’s economic development as a result Greater Sunrise’s gridlock. But Bishop’s bold words offer promise, and the decision announced on Monday to schedule annual meetings with her Timorese counterpart Soares prevents another five-year drought between visits.